As it does for many of us, the approach of January inspires me to review the past year for important ideas, and new insights to carry forward. In that spirit I have been going through notebooks lying on my desk and reviewing old notes to myself. This morning I came across a couple of pages about the North America Reggio Emilia Alliance (NAREA) conference from a year ago. The conference was held at my former high school (The Cambridge School of Weston) and hosted by my children's preschool (The Children's Garden). One of the sessions was presented by an art educator from the Eric Carle Museum who talked about their art making/studio space. What she said has resonated with me for the past year and I recently returned to the notes I took to refresh my memory. Her perspective on the atelier is unexpected and lovely. The art studio at the Eric Carle Museum is the same size as the gallery space which displays Carle's own work, and of the reading library. That in itself is unusual. There is equal priority given to display of the master artist, visitor making and creating, and focused investigation. In fact, it might be more accurate to say that looking at art, making art and reading about art are all seen as equally important means for delivering on the mission of the museum. "To be a teacher, you need to be a learner and empower others to be learners with you." This idea is at the heart of how the organization functions. Although the museum is about illustration as an art form, and about elevating Carle's work, the museum is open to new ideas from all directions. The focus is on meaning making and discovery. And programs are intentionally designed to appeal to a broad age range. "The Studio is a laboratory for thinking" - Gandini and Topal wrote in Beautiful Stuff. And at the Carle Museum the art studio is seen as a space in which visitors are invited to talk about art and their response to it. But within the galleries as well there is an emphasis on encouraging visitors to talk to one another, communicate about the art, and debate. The docents use facilitated discussion to ensure that groups participate actively. The idea underlying this methodology is about doing something with the audience, not for them. The goal is not only to make the looking at art active (VTS), but also to learn what people are thinking - what is in their minds so that the museum can learn from its audience. (There is a page on their website with links to documents discussing their philosophy in more detail). The studio functions as a What If . . . space rather than a How To space. The space is designed to support visitor-to-visitor conversation. There is display of visitor-made work, and a mail box in which visitors write postcards for future visitors to read. Large windows that look out on the garden provide a kind of living sculpture and backdrop to visitor work. One recent project invited visitors to make their own garden mural on the window, interacting with the natural environment as well as with the collaborative work-in-progress. Because the context is Eric Carle's work, and part of the concept is to find inspiration in his work, staff select a set of materials for visitors to work with, or set up a framework for them to add to. These starting points are chosen to offer multiple entry points and to encourage visitors to think in new ways. Within the studio the staff are also playing around with how to organize and present materials. They have been creating new categories such as thick and thin, or primary and secondary, rather than traditional ways of sorting art supplies. This act of setting up the space is an act of preparation for visitors and it seems staff are still finding the right mix of openness and structure that works philosophically and logistically. For now, these starting points act as seeds which grow organically as visitors take them on and make them their own. The bigger picture is problem solving. When visitors are stuck staff ask them "what are you trying to do and how can we do that with what we have?" In fact, staff play a large role in the studio - asking questions, engaging adults and finding ways to include them. They treat communication as another experiment. They want displays to excite visitors and they want visitors to be curious. Recently they have been focusing on collaborating on displays with visitors - treating these also as starting points and inviting visitors to document their activity in the space as part of the communication for future visitors. Pedgogy is movement. It is a journey of discovery. And it comes with responsibility to listen to others, solve problems and document the process. One of our current projects, The Fort Collins Discovery Museum has posted a set of panoramic views of the job site. It's a lot of fun for us to see things progress. For those that live there in town, it must be really exciting. "We really think that our PALs in a small way start to bridge the worlds of public libraries (who are good at early literacy and programming) and children’s museum (who are so good at interactivity and sparking creativity among other things.) Our missions are so similar that it just seems natural to try and find more common ground." As their name suggests, PALS are free-standing and movable elements that contain hands-on inquiry-based activities. They live in and among the stacks of the Rancho Cucamonga, CA library. And in fact, the PALS are intended as an encounter with interactive playful learning as a complement to the more expected cognitive learning libraries support. The PALS bring together a combination of interactives + library materials (books and media) + supporting materials about learning through play. Although they can be docked in the children's room, they can also be located outside, or placed strategically for users to discover as they browse for books. We have uploaded photos to our facebook site from the opening. The PALS are essentially a smaller, fast-tracked part of a larger vision for a children's museum in the library. 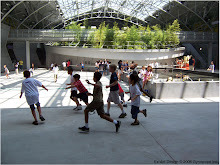 In the first phase we completed a community needs assessment and master plan for a children's museum addition. After completing that work, the library wrote a grant to move forward with the PALS as a way to build staff capacity and pilot some of the ideas about bringing play into the stacks. In thinking about the design of the PALS we considered the scale of the library and the space available for activities. Each PAL is about 25-50SF. Each is designed to support a range of play styles including imaginative play, experiential learning, constructive play, aesthetic exploration, and creative problem solving. Their topics range from science and engineering, to visual and performing arts, to history, and to environmental science. Although the themes were selected to support the interests of library users and staff, the library believed the PALS would spark additional interest and demand in these areas. So prior to installing the PALS the library developed their collections on these specific topics - including 500 new books. The PALS require minimal power, water and lighting. Overall, the PALS are low tech, modular, and portable. They include space for books and graphics, and utilize green, sustainable materials. The PALS’ are designed to not need crates for transportation or storage, but smaller units have their own tops which allows them to be "closed" like a “suitcase”. *Pioneering new ways of engaging families in learning in libraries, using interactive museum exhibits as inspiration. *Creating a scalable model which could spread to other libraries. *Offer activities that tie into the big themes of literacy, arts and culture. *Change how people think of the library by expanding and enriching the library experience. *Support literacy through layered activities that allow users with many interests and skills to be successful. *Make the library more family friendly. *Providing experiences that motive users to learn, light a spark of interest, and build self-confidence about creative exploration. *Help families realize the role of play in the learning process. *Encourage families to consider the library the hub of the learning community, not just a place to borrow books. *Increase access to playful activities, the time people in the community spent playing, and broaden the types of playful activities they engaged in. *Bring joy into families lives. The PALS create a unique blend of reading, browsing and doing at the Rancho Cucamonga library. They are an experiment that is working. We are always looking for new inspiration and points of reference. What works? How are people innovating learning design? What new ideas are out there or exemplary projects that we can draw on? So when friends of mine set off to visit some Reggio inspired pre-schools I asked them to take lots of pictures. Susan MacDonald is the former Director of The Children's Garden, a progressive preschool and Lucinda Burke was the head teacher for 4-5 year olds there for many years. They now work as consultants for other Reggio inspired schools and are starting their own school in Metro Boston. One of the interesting thing about the schools they visited - The Blue School and La Petite Ecole in NYC - is that both are works in progress. Both are in temporary quarters and both have the feel of an experiment in which the organization is learning alongside the students. Reggio has been a touch stone for many children's museums, and for art rooms and workshops in other types of museums as well. As these pictures show, the core ideas behind the Reggio approach continue to offer opportunities to create distinctive, inquiry based environments which honor learners and celebrate learning as a community. I will let the images largely speak for themselves. Details like the dress up box lid make this space magical. The window is lined with mirror to double the view.